1 of 3 Heat oven to 425 degrees F. Spray a baking sheet with nonstick cooking spray. 2 of 3 Roll out pizza dough onto prepared baking sheet. Spread enchilada sauce over crust to within 1/2 inch of edges. 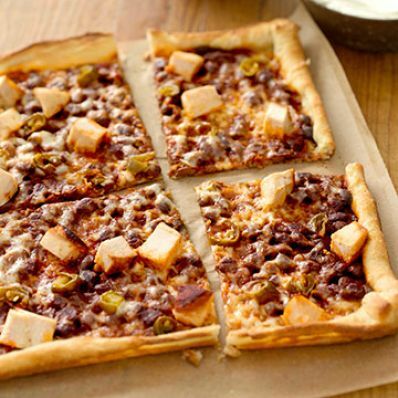 Evenly scatter cheese, beans, chicken and jalapeno slices over the pizza. 3 of 3 Bake at 425 degrees F for 16 to 17 minutes or until crust is golden brown and top of pizza is bubbly. Allow to cool slightly and cut into 8 slices. Serve with sour cream and sliced black olives, if desired.